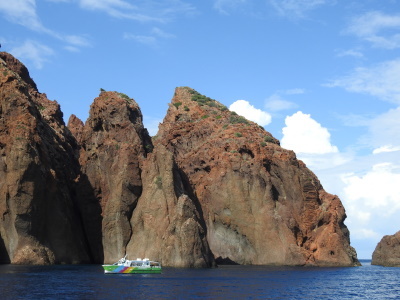 Gulf of Porto: Calanche of Piana, Gulf of Girolata, Scandola Reserve is a natural area with dramatic geological landforms and wealthy undersea life. It also is the habitat of the rare osprey, peregrine falcons and bearded vultures. The Gulf is situated on the western coast of Corsica, between Punta Muchillina and Punta Nera. The sheer cliffs of the Gulf contain many grottos and are flanked by numerous stacks and almost inaccessible islets and coves. The coastline is also noted for its red cliffs, some 900 metres high, sand beaches, and headlands. Although the views of the Gulf of Porto from Piana, Porto and Girolata are spectacular, it was really necessary to take a cruise with one of several operators in Porto to get a close-up experience of the coastline. The Calanches of Piana on the south side are steep rugged cliffs of red rock, the colour of which varies with the light over the course of a day. The cliffs are riddled with caves, some at sea level which vessels can enter. Girolata is a small touristy village beside the gulf's only beach. It is only accessible from the sea, being surrounded by steep, high cliffs. 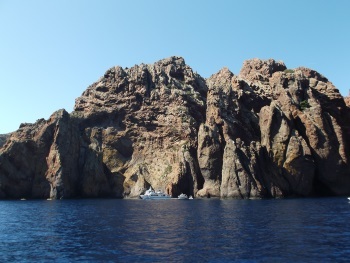 The Scandola Reserve is an area of rocky stacks rising vertically out of the water, with arches and other features only reachable by boat. The bird and sea life is prolific here. Porto is difficult to reach because of Corsica's terrain. I travelled there by bus from Ajaccio, and away to Calvi. Both routes involved crossing steep mountain passes and fast-flowing streams, both journeys of several hours duration. But very scenic with frequent glimpses of the coast. Corsica is by far, by FAR, the most beautiful place I've ever visited. Crystal-clear water, pristine beaches, mountains, and a friendly atmosphere. I would recommend it as a vacation spot to everyone. From "Cape Girolata, Cape Porto, Scandola Nature Reserve and the Piana Calanches in Corsica" to "Gulf of Porto: Calanche of Piana, Gulf of Girolata, Scandola Reserve"
Name Change to add "...and the Piana Calanches"
Name changes: Two times: in 1996 to add "...and the Piana Calanches", and in 2006 from "Cape Girolata, Cape Porto, Scandola Nature Reserve and the Piana Calanches in Corsica" to "Gulf of Porto: Calanche of Piana, Gulf of Girolata, Scandola Reserve"